Have you ever watched a cooking programme where the chef says something along the lines of “and here’s something you can rustle up from your own store cupboard” ? Then they open their store cupboard and it just happens to be sufficiently equipped to build a self-fuelling fighter jet from scratch and feed its pilot for 3 months. And then you think “yeah, right”. 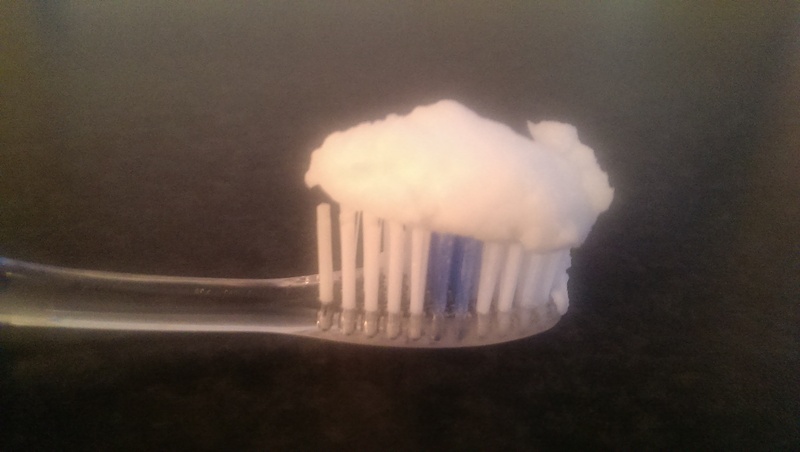 Inspired by the Store Cupboard Theory, today’s adventure sought to answer the question “what, if anything, can I rustle up from my own store cupboard?” I was pleasantly surprised to find that I had all the ingredients to make my own flouride-free toothpaste! As you can see , the mixture did ripen into perfect toothpaste consistency eventually! Whilst the maturing process has in no way improved its flavour, I may make some more on the basis that it seems to numb your taste buds for hours (which may come in handy should I be force-fed Brussels sprouts 😛 ). I am also thinking “fighter jet fuel”.